November 24, 2011 marked the lyrical feast, Bovember2: Music for the Soul, release date. Since then, Bo Dean has been in the shadows perfecting his craft. Debuting 4 installments to his "Road to Mash Up" series, depicting the time and effort that has been spent on his new project, the #MashUp. 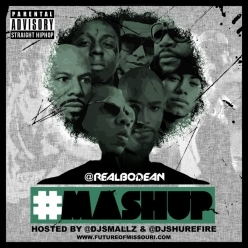 #MashUp is a new project from Bo Dean that challenges and takes his artistry to new levels. He takes a slew of instrumentals from some the rap industries most honored emcees. The constant switch ups in each song forces Bo to switch up his flow, delivery and even subject matter on each MashUp. From Araabmuzik to Lil Wayne, all the way up to the "Big Homey" Jay Z, Bo Dean transforms commonly heard songs into his own, leaving the original versions just not the same. Buzz of this album has already made its way down south to the ears of DJ Smalls, who is also the host of "The Mash Up". Find out why Bo Dean has been dubbed the "future of Missouri". This is one of the most creative HipHop projects that has dropped in years, a definite listen!!! DO NOT miss out on this album! #PRESSPLAY AND #ENJOY!! !